In addition to our Advent calendar, my children and I celebrate Christmas by reading at least one Christmas themed picture book at bedtime every night. Here is one of my favorites. I’ve always been fascinated by other cultures. My degrees in literature in two languages - English and Spanish - are proof. My family and I live in San Diego and I feel it's important for my children to learn about our Hispanic friends and neighbors. 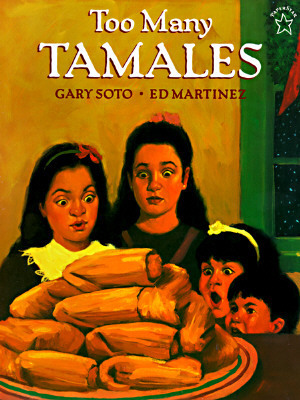 Too Many Tamales teaches children about a different cultural tradition. It’s also a tale about why it’s better to tell the truth than cover up a problem. Soto’s book is more than a lesson in culture or morality; the beautiful and original Christmas story is told with such warmth and humor that children of all ages will want to read Too Many Tamales again and again. Scholastic has a wonderful discussion guide about Too Many Tamales. Too Many Tamales is one of the videos in Weston Woods’s Stories from the Hispanic Tradition. Love to cook with your kids? Make tamales (and invite me over)! Here is a kid-friendly recipe for a non-traditional approach to sweet tamales. Since making tamales is a lot of work, here is an easier recipe. Not authentic, as there are no husks or wrapping involved, but equally delicious I'm sure! For more book ideas, check out Susanna Leonard Hill's Perfect Picture Book Friday on her blog. Here is a link to past reviews (organized by topic).